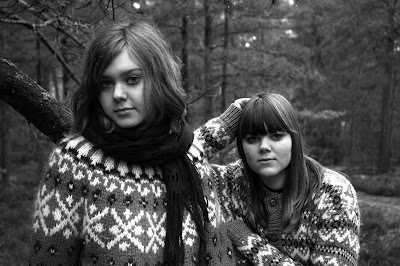 Swedish Music For Dummies: First Aid Kit <--- Young talent! The sisters Klara Söderberg, 15, and Johanna Söderberg, 17 is the duo First Aid Kit. And what a duo! Despite the fact that they hate being called sweet - that's just what they are. They are singing sweet folk-pop and you wouldn't guess their early age from their lyrics. They were discovered by Karin Dreijer from The Knife and Fever Ray and that's why their debut EP Drunken Trees is released on her label Rabid Records. The EP was named Drunken Trees after watching Al Gore's An Inconvenient Truth that mentions how trees lean and look drunken when the permafrost is melting. Insightful title! As you might tell, Im already a fan of First Aid Kit, and i think you should be too. So check out their music at Spotify, and the videos below, the Fleet Foxes cover is wonderful! And if you like it, buy it! Pssst! They are doing a UK tour at the moment, make sure to check out the tour dates on their official website. Find out more about the sisters on their official website and on their Myspace!